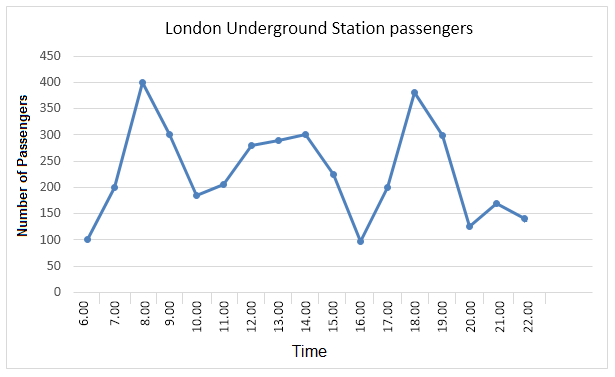 The line graph compares the number of people using Underground train in London every hour from 6 to 22 o’clock. Overall, the number of passengers using Underground station fluctuates through a day. Seven and eighteen are two most popular time to using this mean of transport, while there is a smaller number of passengers are at Station at six and sixteen. In the morning, at six, the number of passengers is just exactly 100 which is the smallest figure of whole graph. By contrast, after two hours, this figure reaches the peak at 400, following by a sharply fall to under 200 at ten. At the following hours, the number of people using Underground station rises lightly by around 100 at twelve. Regarding to remaining time of a day, the time period from twelve to thirteen witnesses a gradual growth from approximately 280 to exactly 300.However, this number then drops dramatically at sixteen to 100. After that, this figure rises remarkably to just under 400, following by a minor fluctuating decrease to around 150 at the latest hour. Seven and eighteen are two most popular time to use this mean of transport, while there is a smaller number of passengers are at Station at six and sixteen. Regarding to remaining time of a day, the period of time from twelve to thirteen witnesses a gradual growth from approximately 280 to exactly 300.However, this number then drops dramatically at sixteen to 100. After that, this figure rises remarkably to just under 400, following by a minor fluctuating decrease to around 150 at the latest hour. Tớ nghĩ phần paraphrase và overview c nên gộp chung lại thành một đoạn. sharply fall => sharp fall nhé. Vì lúc này từ fall đang ở dạng danh từ nên phải dùng tính từ sharp để bổ nghĩa.